Specially designed for the professional installer. 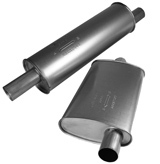 Extensive use of patented Single Cartridge Muffler Design. Aluminized heads, shell and wrapper. Cover hundreds of original equipment applications with minimum inventory investment. Expandable necks for easier sizing and installation. 21 universal fit muffler designs. Aluminized materials for superior corrosion protection. Ideal for the economy buyer.